Blackclough Barn at Blackclough Farm in Quarnford, near Buxton sleeps 7 people. Blackclough Farm near Buxton is in a rural location and dates back over 100; Blackclough Barn offers magnificent panoramic views over the Peak District, Derbyshire, Cheshire and Staffordshire countryside. 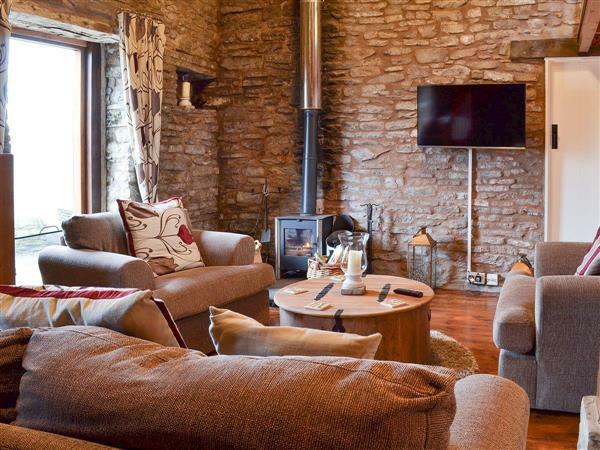 Beautifully furnished to a good standard throughout, Blackclough Barn is linked internally by a large shared boot room to Blackclough Farmhouse, making them perfect for one large group or two completely independent families. Blackclough Barn benefits from a superb wood burner, making it warm, comfortable and full of rustic character with a galleried landing. Located in a Site of Special Scientific Interest which legally protects the surrounding wildlife and geology, and with only the sounds of the flowing river and sheep as neighbours, the location is remote and just perfect for relaxing and re-energising. Ample outdoor pursuits are available locally including walking, mountain biking and climbing. Although remote, England’s highest village, Flash, complete with local shop/café and local pub serving traditional food is just 1½ miles away. The spa town of Buxton is just 5½ miles providing ample amenities and tourist attractions, and a number of other Peak District towns and villages are within easy reach, including Bakewell, (home to the magnificent Chatsworth House and Haddon Hall), Hartington and Tideswell, which can all be reached in around ½ an hour. The shop, pub and restaurant are all 1½ miles from Blackclough Farm near Buxton. Blackclough Barn can be booked together with Blackclough Farmhouse (ref UK4067 [Blackclough Farmhouse]) to sleep up to 12 people. Ground Floor: 3 steps to entrance. Kitchen/dining room: With electric oven, electric hob, fridge, dishwasher and stone flag floor. Bedroom 1: With twin beds. First Floor: Bedroom 2: With king-size bed, single bed, beams and en-suite with shower cubicle and toilet. Oil central heating, electricity, bed linen, towels and Wi-Fi included. Initial fuel for wood burner included. Boot room (shared with other property on-site) with washing machine and tumble dryer. Sitting-out area with garden furniture and gas barbeque. 2 dogs welcome, to be kept on a lead at all times (sheep country). Private parking for 3 cars. Please note: The property has a natural water supply from a spring. The access to the property is by a remote single track road and very steep driveway, and there is an unfenced stream 220 yards away. Holidays at Blackclough Barn, Blackclough Farm run from Friday to Friday. Pets allowed at Blackclough Farm - Blackclough Barn. For a better idea of where Blackclough Farm - Blackclough Barn is, you can see Blackclough Farm - Blackclough Barn on the map below. Blackclough Farm - Blackclough Barn is in Staffordshire; should you be on the lookout for a special offer, you can find all the special offers in Staffordshire. It's always worth checking to see what is on offer at the moment. Do you want to holiday near Blackclough Farm - Blackclough Barn (UK4068), you can see other cottages within 25 miles of Blackclough Farm - Blackclough Barn; have a look to find your perfect holiday location.